All the plays and monologue scripts are complete on this site and can be downloaded for perusal. If you wish to have a script emailed please send your request by clicking the order script button above. This web site was created to help you know more about me, my history in the theater and my plays. I hope that the information found on this site has inspired you to take that important next step – a full production! NOTE: Request for Production: The receipt or download of my script(s) does NOT automatically convey rights to perform or otherwise present any of the works under copyright listed on this site. A legal contract or explicit written permission is required. To inquire about possible production rights and royalties, contact the author. Infringement of the author's legal rights will be referred to the Dramatists Guild, publisher or legal counsel representative. 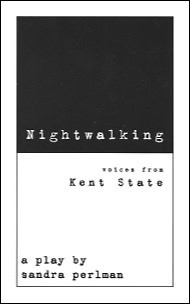 BOOK ORDER: Nightwalking has been published in book form and can be ordered directly from Franklin Mills Press. I know that high school and college students are surfing to find exciting new short plays and monologues for auditions, forensic competitions and classroom use. I have had many requests for email versions of these short plays, particularly Covers. I have made the complete plays accessible on this site so that you may easily access them to see if they fit your needs. You may perform these free of charge if those are the reasons you are requesting them. All other uses including student productions or workshops, require permission from the author. Email me with all of the important information of who you are and where you are and why you are requesting it and I will try to reply promptly. Remember that you are dealing with copyrighted material, and this is my life as well as my work. So ask permission-and if you're charging admission for your school performance, pay me royalties too! Playwright's note of caution- Many of my plays contain situations and language which are often considered "adult" by others in the rating field. You must decide on both the maturity level of your audience and yourself in considering any of these scripts. Playwrights write for audiences. Please email me their reactions, reviews, etc..